Author: Carlos Cetina. Inventor: Kevin Pacey. The textarea in Edit mode that it titled "Rules, Written in HTML for Players to Read:" should be used to provide a brief description of the rules that players can consult without looking at the rules page. It should not be used simply for providing a link to the rules page. There is already a Rules URL field for that. Yes, the only difference is that there are two queens per side instead of one. I have already fixed the bug on the link to the ruleset page. After going out this evening, I have returned and succeeded in making my second move in my Sac Chess game, and my first move in my Glinski's Hexagonal Chess game. Thanks Fergus. 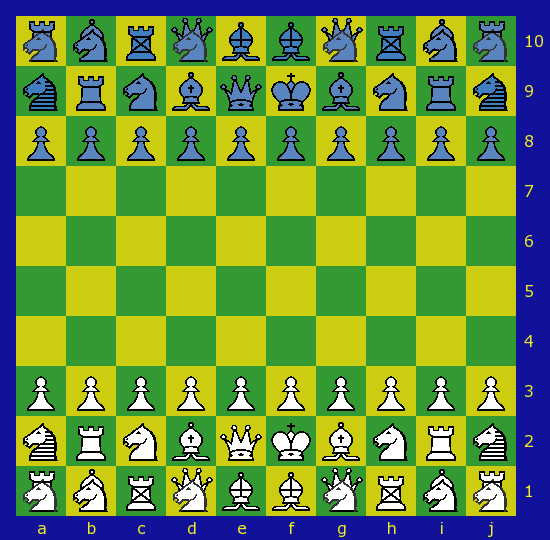 A question to Carlos is, for the Hexagonal Chess variant that we are playing, namely "Glinski's Hexagonal Chess (Symmetric)", is the only difference between it and Glinski's (original) Hexagonal Chess game that the start position is different, that is that there are two queens per side used instead of one queen? I did not see any rules given when I looked up the webpage for "Glinski's Hexagonal Chess (Symmetric)", in the big listing of games found on The Chess Variant Pages, so I have assumed (so far) that the basic rules are indeed the same for both the original & Symmetric versions. I have made it a bit easier to move if you make a wrong turn. There is now a button in View mode for going to a form for making a move. But what you should normally do is this. Go to the Logs page, enter your userid and submit the form, then you will see the games you can move in, and for the games you are already playing, the link will bear your name. Click on your name for a particular game, and you will be brought to the form for making a move. Sorry for your troubles. The website is working fine and it has not had any downtime. Hope they will be resolved soon.